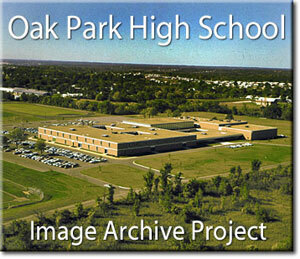 This site contains a visual history of Oak Park High School (Kansas City, Missouri) from 1965 to 2003. Most of the images were scanned from the Cambia yearbook negatives, and a few are from the Log newspaper negatives. You can see how people, fashions, the community, and the environment have changed through the years. Alumni Courtyard We have finalized the plan for the new ALUMNI COURTYARD. We are excited to offer all former/current staff members, alumni, and local business partners the chance to purchase a Legacy Brick for the courtyard. You can also purchase a brick in honor of someone (i.e. a former staff member or family member). Download the Legacy Brick order form if you are interested. You can add notes and information to any image in the collection. If you know the names of people, or have some additional information about any of the photos, click the photo to enter that information. Susan Pupkes-Carlson ('79) has done a tremendous job adding notes to many images in the collection. You can see all of the notes here.